In addition to the Inquiry reports here NHS London commissioned two reports into mental health homicides in London between January 2002 – December 2006. 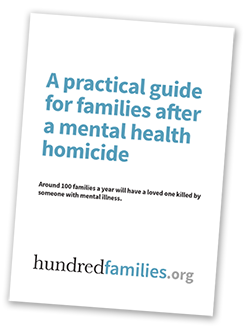 The report by consultants Verita found 26 mental health homicide cases during that period and their report was published. The report by Caring Solutions Ltd found 69 cases over the same period and investigated at a sample of 40 cases (which included a very high number of ‘stranger’ homicides). The report was not published. A copy was obtained under the Freedom of Information Act. 03 Dec 2010 Joan Mungall Tooting Depressive fatally smothers wife. 09 Jul 2010 Nezir Golaj Cricklewood Mentally ill man fatally shoots men. 08 Sep 2009 Perseus Coore New Cross Paranoid schizophrenic repeatedly and fatally stabbed brother then set flat alight Previously undiagnosed? 04 Jan 2009 Rose Jatto Camberwell Schizophrenic repeatedly and fatally stabbed mother Undiagnosed before assault? 05 Jun 2007 Ahmed Shah Southall, Middx Mentally Ill taxi driver fatally stabs businessman Paranoid Psychois. 05 May 2007 Mickael Bousson (5) Thornton Heath Mentally ill woman suffocates two of her children. 05 May 2007 Mary Bousson (6 wks) Thornton Heath Mentally ill woman suffocates two of her children. 06 May 2006 David Rodway Bromley Schizophrenic fatally stabs stranger in back of the head with screwdriver On bail for previous stabbing at time. May-05 Freddie Reid East Ham Schizophrenic with DiP fatally and repeatedly stabs father 37 times Family taken him for MH asssessment weeks before. Missed follow up appointment. Mar-05 Brian Messitt Swiss Cottage Paranoid schizophrenic approaches pensioner from behind and splits head open with axe. Repeated blows. Jul-01 Nicole Smith (4) Greenwich MH Patient beats daughter to death with leather belt. Inq? May-01 Felicia Oyejola Wembley Schizophrenic fatally stabs mother 22 times in neck and chest Long MH history, previous stabbings, failed to take meds. May-99 Stelios Economou Hatch End Station,Pinner Schizophrenic fatally pushed stranger in front of train Ind Inq 2003. Long MH history. Nov-98 Jenny Morrison (s/w) Balham,S London Paranoid Schizophrenic fatally stabbed social worker more than 100 times Ind Inq 2002. Previous violence,failure to take meds. Its amazing the effect words can have. we need help BIG Time.